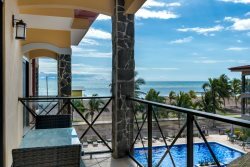 La Paloma Blanca is a beachfront condominium complex that offers luxury, tranquility and relaxation. Situated at the peaceful south end of Jaco Beach and only an hour and a half drive from Juan Santamaria International Airport. There are four swimming pools on site, one extremely large free form lap pool with cascading waterfalls, as well as a kids pool beside it. There are also two beachfront pools, which are smaller and more private. All pools include lounge chairs for your rest and relaxation. You have direct access to Jaco beach and can walk out from the pool and put your feet on the sand. There is a small rancho area situated beside the main pool in which you can use with a fully equipped BBQ as well. This beachfront vacation community offers stunning 2 and 3-bedroom condos.